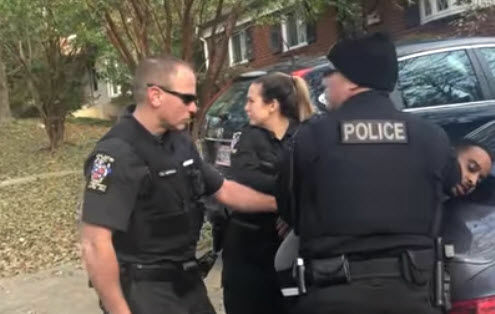 WASHINGTON — A Silver Spring, Maryland man who helped his intoxicated neighbor get home two weeks ago says Montgomery County police detained and arrested him because he is black. On Nov. 17, 23-year-old Samir Ahmed took his drunk friend home, in the 800 block of Malibu Drive in Silver Spring. Montgomery County police say they were called to the scene by fire and rescue personnel to help with a possible intoxicated person. Within minutes after getting his friend home safely, Ahmed was seen on smartphone video posted on Instagram being held against the back of a car, in his driveway, by three Montgomery County police officers. “You’re a Good Samaritan in MoCo until police-proven Black. Once that occurs, you’re just an ordinary criminal suspect,” said Ahmed’s defense attorney, J. Wyndal Gordon, in a Facebook post. Gordon said an officer said Ahmed was detained because an officer smelled marijuana. The 18-minute-video included neighbors loudly peppering officers with questions and complaints that he had done nothing wrong. Ahmed told The Washington Post he believed he was arrested because of his race. “The Department is reviewing the circumstances surrounding the arrest to determine if any department policies, procedures or laws were violated during the incident. This assessment will include a review of the responding officers’ body-worn camera footage,” the statement said. However, police will not release the footage publicly. “At this time, body-worn camera footage will not be released as it is evidence in the upcoming criminal case,” police said. Ahmed was charged on four counts: disorderly conduct, resisting arrest, failure to obey a lawful order and obstruction and hindering. He is due to appear in district court on Jan. 7, 2019.